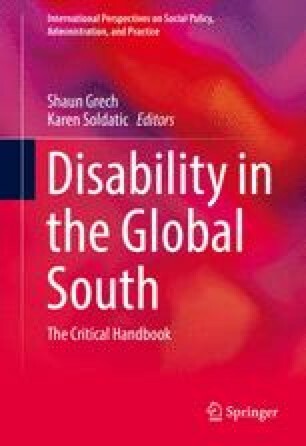 With the increase of disability activism internationally, various global institutions and international development organisations have started to mainstream disability in their work, mostly at the level of rhetoric. Many have also developed disability statements and policies to guide their work. This chapter explores these developments, examining what strategies such organisations have adopted to introduce the disability strand in their work. At the same time, we provide a critique of how efforts at mainstreaming or including disability in their work are translated into practice. In the process, we expose some barriers that continue to maintain disability on the peripheries of inclusive development; and practices that sometimes may work to the detriment of disabled people’s emancipation. We also briefly critique the World Report on Disability, exploring the possibilities of it being used as a catalyst to the institutions’ disability mainstreaming efforts. We draw on additional examples emerging from Africa where we reside, in search for promising practices, where there is genuine disability mainstreaming by international agencies in trying to understand disability as an ubuntu and development agenda. Albert, B., & Harrison, M. (2006). Lessons from the disability knowledge and research programme. In B. Albert (Ed. ), In or out of the mainstream? Lessons from Research on Disability and Development Cooperation (pp. 1–12). Retrieved November 9, 2013, from https://www.uea.ac.uk/polopoly_fs/1.3897!offprint_ch1.pdf. CBM. (2008). CBM and the twin-track approach to disability and development. Retrieved March 23, 2014, from http://www.cbm.org/article/downloads/54741/TwinTrack_Paper_final_version_October2008.pdf. Chataika, T. (2013). Gender and disability mainstreaming training manual. Disabled Women in Africa: GIZ Sector Initiative Persons with Disabilities on behalf of BMZ, Germany, pp 1–75. Retrieved May 2, 2014, from http://www.diwa.ws/index.php?option=com_phocadownload. Ncube, J. M. (2005). Capacity building of disabled people’s organisations in Mozambique. Disability Knowledge and Research. Retrieved July 7, 2014, from http://hpod.org/pdf/CapacityBuilding.pdf. Zacher, M. (2001). International Organizations. In the Oxford companion to politics of the world. Oxford: Oxford University Press. Retrieved March 13, 2014, from http://oxfordreference.com/view/10.1093/acref/9780195117394.001.0001/acref-9780195117394-e-0366.